Mayors of U.S. cities are coming around on bicycles, support police reform even across party lines, and overwhelmingly see aging and underfunded infrastructure as their largest challenge — but they’re not confident the state or federal governments will help them solve it. Those are some of the findings of the 2015 Menino Survey of Mayors, released last week by the Boston University Initiative on Cities and the United States Conference of Mayors. With responses from 89 mayors in 31 states, this second annual report offers insight into how the leaders of cities large and small view their top priorities, challenges and partnerships. This year’s survey focused on seven topics: infrastructure, finance, biking, policing, inequality and poverty, housing, and constraints. Gentrification and climate change, both featured issues in last year’s survey, went largely unaddressed. The 2014 report also broke down responses about nearly every topic by city size, wealth and mayoral political party; the 2015 report does so only on specific issues. 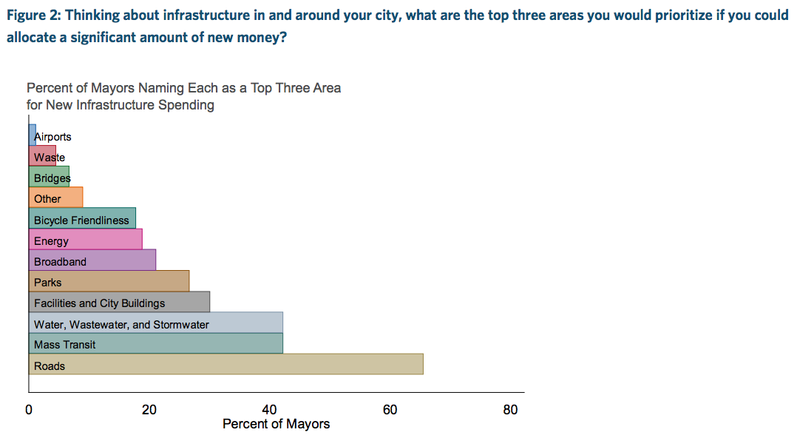 For the second year running, infrastructure topped the list of mayoral challenges. More than half of mayors responded that underinvestment in infrastructure is the number one state or national issue creating the largest problem for their cities. Overall, roads were the asset considered most in need of help. When asked, however, how they would use an unrestricted grant to fund a single, large infrastructure project, big-city and small-city mayors allocated resources differently. Nearly 40 percent of big-city mayors (with populations greater than 300,000) said they’d fund a mass transit project. Only 15 percent of small- and medium-sized-city mayors said they’d spend it on transit, with 20 percent preferring roads and another 20 percent choosing investment in city buildings. To implement these projects, the mayors noted that state and federal government are their most frequent partners, but the survey also revealed a fraught relationship between cities and their states. 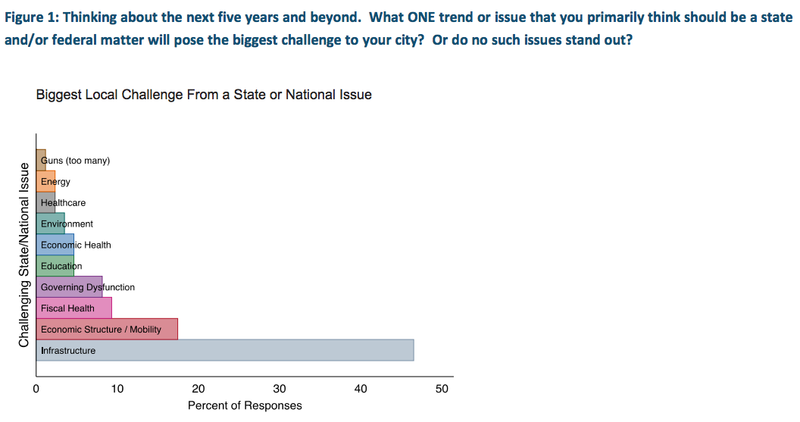 Despite the recent global visibility and influence of mayors, respondents said their greatest constraint is the lack of financial support from state and federal governments, and state-government-imposed restrictions on cities’ policymaking autonomy. When it comes to infrastructure projects, the survey suggested particularly high tensions. In the 2014 survey, mayors reported state governments as their least cooperative, but most frequent partners. Since the majority of mayors believe constituents judge them based on the quality of local infrastructure, that underinvestment can be a political liability. As for small infrastructure projects, 70 percent of mayors overall supported improving bike accessibility, even if it meant sacrificing parking and driving lanes. But when that number is broken down by party, partisan divisions emerge. Eighty-eight percent of Democratic mayors supported street designs that favor cyclists over drivers; 44 percent of Republicans did — though the report notes this could be a reflection of the characteristics of the cities they govern, as opposed to a purely ideological difference. When it came to affordable housing, however, the ideological split was clearer. More than half of mayors said they were “aggressively addressing” housing affordability, but they are divided on their support for specific policies, both by political party and by city wealth. Sixty percent of mayors governing pricier cities support policies that require developers to include affordable housing in new projects, even if such a policy discourages some new development. Only 40 percent of mayors supported it overall. Half of Democratic mayors supported such mandates — a still-modest number — compared to just 20 percent of Republican mayors. To improve fiscal health of cities, mayors said they’d be least likely to raise property taxes, privatize city services or eliminate city programs. They’re less opposed to reducing city staff, raising other taxes and fees, and renegotiating contracts. Again, party identification mattered. Seventy-four percent of Republicans were opposed to raising property taxes, compared to 43 percent of Democrats. When it comes to police reform, though, bipartisanship reigned. Mayors showed an unmatched level of support for reforms advocated by the President’s Task Force on 21st Century Policing. Ninety-three percent of mayors supported body cameras, 87 percent supported independent investigations of police-related shootings, 85 percent supported publicizing arrest and crime statistics by demographics, and 65 percent supported civilian review boards. The survey also gave an interesting glimpse into how cities view each other. When mayors were asked which three cities they had recently looked to for policy ideas, New York, Chicago, Los Angeles, Philadelphia, Denver, Austin, Boston and Salt Lake City topped the list.